These elements are often full-time jobs for employees of larger companies, and there is a lot to learn. However, it is possible to run your own AdWords campaign for your small business if you take the time to learn the basics. Our Google AdWords guide for beginners will cover the essential information you need to get started in your online marketing endeavors. This first example of ad placement is what we most commonly associate with Google AdWords. You create a short text ad like in the image above, and tell Google what kinds of searches you’d like that ad to appear in. Ideally you want your ad ranked #1 so it is displayed at the top of the search engine results page (often shortened to SERP). In a later section, we will go over how to accomplish this. Search engine ads typically only show text, with an exception being specific e-commerce products occasionally showing images of the product beside the ad. Banner and other image ads are shown in Google’s “Display Network” – over a million sites that have agreed to show Google advertisements. Image ads can have small interactive elements, such as the “Find A Hotel” or “See Deals” buttons on the ads above. The Display Network also allows for video and ‘rich media‘ ads, which are simply ads with added features and interaction, such as the survey advertisement above. Once you’ve entered your business’ website and email, you will be taken to a page to create your first campaign. An AdWords “campaign” is an advertisement (or group of ads) created around a general theme. For this example, I am going to create an advertising campaign to sell online personal training services. Google auto-populates a few fields for you, based on your business’ website. As we customize these fields, the values in the highlighted box will change. Selecting if you want the ad to show in SERPs, the Display Network, or both. 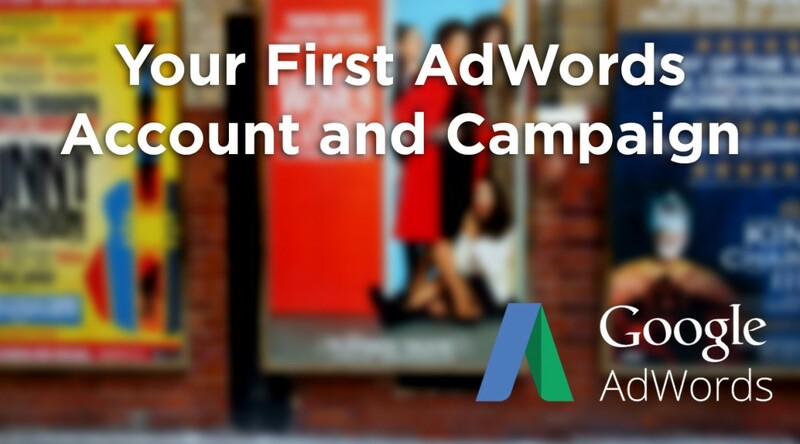 AdWords is based off of a daily budget you allot to a campaign. In our experience working with small businesses, most think in terms of monthly or quarterly budgets instead of daily – ourselves included. One of the greatest benefits of an AdWords campaign is that you only pay when a user clicks your advertisement, and you will never go over your daily budget. If your ad gets $10 worth of clicks by 3PM, it simply stops showing until the next day. Clients often ask us how much money is appropriate for an AdWords budget, which is a tough question to answer for your first campaign. Generally the first few months of your campaigns are experiments to see what keywords are converting well, which ad copy is performing better, etc. Typically to receive good data and feedback on how well your ads are doing, a budget of at least $1000 per month is ideal. Where you want your ad to show will vary largely on your industry. For instance, if you are an online store and do not provide international shipping, you would want to constrain your ad to only your home country. Alternatively, if you are creating a campaign to specifically gain more business in Russia, you would want to target there are surrounding countries. In later steps you can choose to create a video or image advertisement, however during your initial set-up you can only create a text ad.